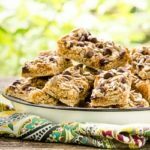 Sunflower Seed Oatmeal Bars are loaded with oats and coconut and topped with chocolate chips and salted sunflower seed kernels. Great for snacks and treats. Preheat oven to 375°F. Lightly grease and line a 13- X 9- X 2-inch baking pan with parchment paper. Beat butter and brown sugar in a large bowl until light and fluffy. Whisk together flour, baking soda, and salt. Add to butter mixture and beat until combined. Press mixture evenly in prepared pan. Sprinkle chocolate chips and sunflower kernels on top.